The recent participation of a team of organised bloggers and social media experts at the Florens 2012 cultural heritage event presented an opportunity to observe the interaction of two distinct systems of cultural information distribution - represented by the conference itself, versus social media and blogging, or new media. In many ways, Florens 2012 was a watershed moment for culture blogging and social media in Italian cultural discourse, amplified on a global level. The conference panels were numerous, and often challenging to cover. Some were perhaps typically Italian in nature, regularly consisting of elderly gentlemen making lengthy rhetorical speeches with little or no audience engagement. A political undercurrent was to be found at the heart of most of these discussions, the foremost issue in many minds being the allocation of funding and consideration of tax breaks for organisations willing to contribute to cultural projects - which is presently restricted in Italy. Yet despite this, some firm steps were taken to bring an event like Florens 2012 up to speed with conferences occurring overseas and in more progressive industries such as technology and fashion. During the planning of Florens 2012, a decision was made to amplify the message of the events across the globe, in real time and via blogs. The previous conference in 2010 did have a Facebook page, but its social media impact was not fully formed, and without an international team to propagate the message, did not have as significant an effect. The invitation of an international team via competition was an idea orchestrated by Alexandra Korey (from Flod), allowing her to pool the web's best and brightest in diverse areas related to culture and economy. "TeamFlorens" was hence born, effectively forming the first organised and officially sponsored international social media team assigned to a cultural event in Florence (and possibly worldwide). This unique approach was a calculated risk, as forming a team consisting of individuals who had not previously worked together carries an element of uncertainty. Yet in each instance, the bloggers selected demonstrated a great passion for their work and area(s) of interest. The concept of blogging is still shrouded in mystery to many outsiders and members of the public. Even though bloggers in certain fields, such as technology and politics have risen to a status (and salary) equivalent to journalists, this is less discernible in cultural matters. Being a seasoned blogger herself, Alexandra was able to determine the best combination of team members for the task at hand. The first TeamFlorens toils away in the Palazzo Vecchio. November 2012. Being part of TeamFlorens, I found the entire experience deeply fascinating, and would often take pause and reflect on the two modes of information distribution - namely the conference versus the team of bloggers attempting to synchronise with it. From a logistic perspective, much was learned in terms of organising a team of individuals of disparate interests. Behind the scenes, team members communicated often, designating which events they intended to cover and collaborating as able. The necessity of having a co-ordinator was highlighted on numerous occasions, with the organisers and presenters often adjusting plans in the last minute. It was the stressful duty of the bloggers' co-ordinator to manage these problems on the fly. Many of these issues may have been avoided with better planning and communication in advance, which will hopefully be factored into the next iteration of the conference in 2014. 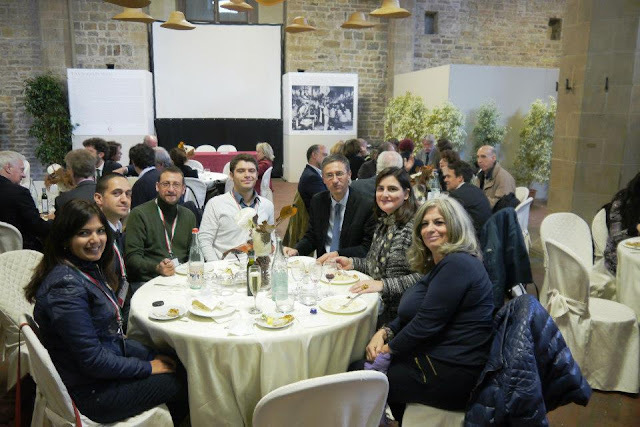 Conference lunches and evening aperitifs provided opportunities for TeamFlorens members to network with officials from the Fondazione Florens and cultural institutions. At the heart of this event was a wish to express the concept of "culture". This is a common, but elusive term, whose varying definitions and implications seem to span the breadth of the human experience. From an anthropological perspective, the definition of culture seems to be expanding. A landmark publication in 2006 explored over 300 definitions of the term. This being said, a neater encapsulating statement about culture was expressed in 1977 by eminent cultural theorist Raymond Williams. The complexity of the concept of "culture" is then remarkable. It became a noun of "inner" process, specialized to its presumed agencies in "intellectual life" and "the arts." It also became a noun of general process, specialized to its presumed configurations in "whole ways of life." It played a crucial role in definitions of "the arts" and "the humanities," from the first sense. It played an equally crucial role in the definitions of the "human science" and the "social sciences" in the second sense. This outline of the complexities of defining "culture" may indicate some of the challenges both conference organisers and the blogging team faced. Some of the drier, more technical presentations were difficult to cover - as the mode of information presented was not easily translated into a form that could be amplified across social media. In addition, some of the topics often fell beyond the scope of the team members attending (eg. landscape preservation) and difficulties were also encountered with the simulcast English translations abbreviating much of the content originally presented in Italian, resulting in a fragmented impression of the content to the members of the press/audience working in English. Organisation committees of future conferences should aim to evaluate which presentations are most ideally suited to be covered by social media teams, or alternately prescribe guidelines regarding the nature of presentations, including duration and visual displays. Despite these challenges, it was apparent that the management of cultural affairs is a vital concern in Italy, and is also a topic which international stakeholders have a vested interest in. Culture is the foremost activity which encapsulates people from all elements of society, and from all nations. It can therefore be validly argued that the use of globally inclusive initiatives and tools to disseminate the substance of cultural conferences is vital. At one level, it was a triumph for the small team of bloggers to have a quantifiable impact, with a digital impression of "Florens 2012" being radiated around the world via blog articles and real time social media output. Along with this however, is the realisation that a more effective and professional coverage is possible, creating an expanded global interest and participation in Florens 2014 and beyond. Congratulations to Alexandra Korey and her team. The events of Florens 2012 have created a bond between team members, each sharing a sense of being involved in an innovative and exciting endeavour, despite the obstacles encountered along the way. This year's bloggers and the their respective sites can be found below. 1. Baldwin, J. (ed.) Redefining Culture: Perspectives Across The Disciplines. Routledge. 2006. It must be thrilling to be at the forefront of something so exciting Hasan. It's promising to see bloggers with cultural substance are finally finding the opportunities to expand into the real world as well. Cheers Sedef. It was a revelatory experience. In a country with such a globally popularised cultural profile, for such innovations to need to be pushed by influential outsiders is evident of some deeper barriers to youth involvement and elements of a press that has not fully embraced technology for content distribution. What a wonderful summary of so many aspects of Florens and our work there. There are many things I would say about this if we were actually conversing, but I will keep this (relatively) short by saying that the recommendations you mention for Florens2014 are worthy, that I hope we have the opportunity to cover Florens again, and that Florens2012 was an amazing series of events that I was honored to attend. However, the scope was so large and the availability of information due to some sessions not being translated made it difficult for us to cover everything. I would suggest that next time, if we work in this capacity again, we should get the word out in bigger ways before the events so that a larger global audience will be following along. Thank you for this marvellous reflection, Hasan. It seems you could be present at Florens2012 yet mindful enough to be reflecting on the bigger picture throughout. I still recall your somewhat dispirited posts after your 2010 visit - how things have changed, and how your voice has become stronger. I even recall your saying would not return to Florence in a hurry except perhaps for a conference... and here you are! What I would not give to pick your brain over a drink or two - where is the web going with culture and art history? I have a feeling you have something to say about it, if not be heavily involved in some aspects. That picture of the reserved bloggers table is quite something - I agree, a watershed moment. What a feat Alexandra and her team has achieved. Best wishes to you all. @Jenna - yes, it seems some forward promotion would have been great, as well as the availability of relevant links/abstracts for each session that could be easily accessed for attending bloggers/press. eg. a resource/web page with links to all presenters sites, social media profiles and other relevant information would also have been handy for us to understand the position and history of various presenters. In many instances people would respond to tweet asking for more information, and there was really nothing available to give. @Stephanie - cheers for the wonderful comment! No drink required for me to tell you in person where I think the web is going with this stuff, simply to endure the arduous journey to Australia :) Perhaps our paths will cross one day. Florence is a city that runs on symbols and images and it is difficult to overestimate the representational value of a table of people in the Salone dei Cinquecento in Palazzo Vecchio OFFICIALLY doing anything for all to see. So, your second photo (“The first Team Florens toils away…”) needs to become a cultural icon as quickly as possible! The conference goers all saw the Team at work and read their tweets on the tweet wall—and they couldn’t help but wonder what these bright and busy people were doing and why. It was an immense achievement on Alexandra's part introducing the social media component into Florens 2012 and I trust that the Fondazione Florens now realizes that they did something new and important—even if it was peripheral to their thinking in the planning stage. Will there be a second TeamFlorens at the next edition of the conference in 2014? After all this exposure in 2012, wouldn’t TeamFLorens be conspicuous by its absence?! Cheers Ed, well at least the scaffolds were out of the way for us to be there at all. I did have to keep pinching myself that we were in this historic space, which has become something of stage for bold (symbolic) steps forward, at least since Vasari anyway. What a neat experience! 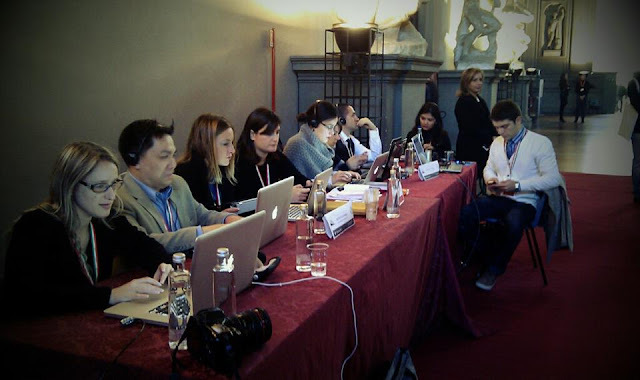 I love that picture of bloggers working in the Palazzo Vecchio. How cool! I hope that I can be a part of something similar in the future. I love to see that there were many notable participants, including National Geographic and Smithsonian. I feel like they are both working hard to engage the public via technology. Cheers M. The Smithsonian and NatGeo are undoubtedly world leaders at dissemination of cultural information using a wide range of tools. It was poignant to hear Terry Garcia admit that no one has really figured out a business model yet, but they still forge ahead anyway. This really is the difference between a forward thinking organisation and one that is struggling to catch up. It is interesting to note that museums such as the Palazzo Strozzi are taking heed and adopting more progressive strategies as well, including spreading out in an international context. It is mind boggling to think that that a juggernaut such as the Uffizi still does not have a decent web site, blog, nor social media presence. They did announce another app recently, yet it wont be available for some time yet. We can only hope things will change at some point. Thank you for this report Hasan. The attention you have given to the impact of the conference on a larger discourse for "cultural dissemination" is unique and outstanding. Dr Edward Goldberg makes a valuable point - in a country where appearances are everything - this team of bright young people would have been noticed by everyone attending. Elsewhere we have read how presenters responded to tweets directly, which is surely a first for the Palazzo Vecchio - the symbolic place of many famous firsts. Good luck to the people behind teamflorens in their next round of negotiations. It seems you now have the opportunity to advance some new ideas. Of course it is not unusual to see Hasan Niyazi and TPP appear in any of this!